Search for Jobs in the U.S. Investing your money tax-deferred. Your money goes into a Roth IRA account after it’s taxed (based on your income at the time of contribution). That means any growth won’t be taxed. Allowing tax-free withdrawals. Because you contribute using after-tax money, you don’t pay any taxes when you withdraw money from your account.1 And unlike a 401(k) or traditional IRA, you’re not required to withdraw a minimum amount of money at any specific age. Contribute as long as you're working. Unlike a traditional IRA, you can continue making contributions after age 70½ if you’re still earning income. Leave a legacy. You can pass your Roth IRA assets to your heirs, free of federal income tax. 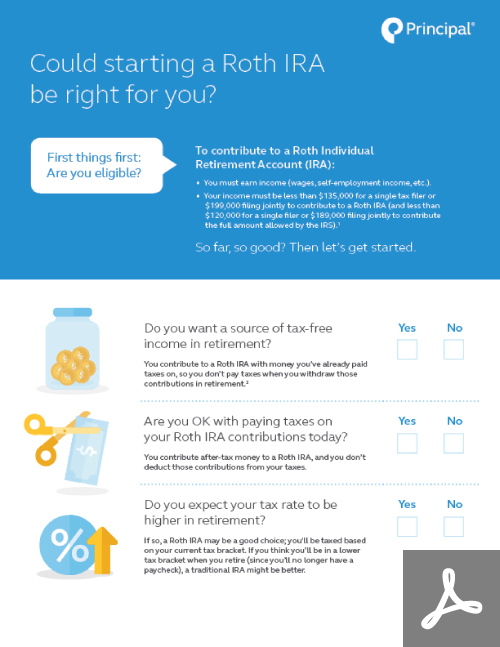 Could a Roth IRA be right for you? Use this quiz (PDF) to help you determine if a Roth IRA might be a good choice for you, and as a starting point to discuss with your financial professional. A traditional IRA is another type of IRA you can choose. Compare a Roth IRA and traditional IRA side by side. When do you pay taxes? In retirement, when you withdraw your savings. Up front, before you contribute. Your earnings then grow tax free. Are there rules around withdrawing your money? You have to start withdrawing money at age 70½. When might it make sense to invest in this account? Find out how a Principal® IRA can help you stay on track to reach your retirement goals. Learn more about choosing a Principal IRA. Start a rollover IRA online. Call us at 800-247-8000, ext. 2251 and work with one of our financial professionals to open your IRA. Let us connect you with an advisor in your area to discuss a rollover IRA. Want more information? Read our article on 3 steps for starting an IRA. Call 800-247-8000, ext. 2251, to get personalized help from a financial professional. Already have an IRA with Principal? Log in to view account information online or add to your account. Saving for college: What are the options? Education is one of the largest expenses you’ll likely face. Our cheat sheet will help you figure out how to save for it. 1 Your account must be open for 5 years and you must be over age 59 ½ to be eligible for qualified tax-free withdrawals. 2 There may be some limits on tax deductibility if your spouse has a retirement plan at work. 3 Based on 2019 tax year. This document is intended to be educational in nature and is not intended to be taken as a recommendation. The subject matter in this communication is educational only and provided with the understanding that Principal® is not rendering legal, accounting, or tax advice. You should consult with appropriate counsel or other advisors on all matters pertaining to legal, tax, or accounting obligations and requirements. Financial professionals are sales representatives for the members of Principal Financial Group®. They do not represent, offer, or compare products and services of other financial services organizations. Insurance products and plan administrative services provided through Principal Life Insurance Co. Securities offered through Principal Securities, Inc., 800-547-7754, member SIPC. Principal Life and Principal Securities are members of Principal Financial Group®, Des Moines, IA 50392. © 2019, Principal Financial Services, Inc.